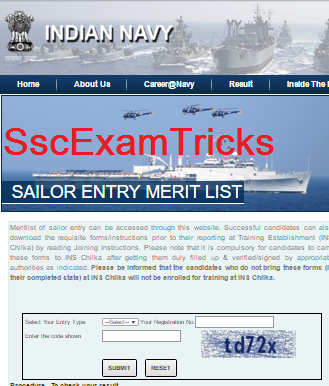 Indian Navy SSR MR NMR Admit Card / Result 2018 - Indian Navy SSR Result 2017 – Download Indian Navy Sailor 04/2018 Batch Merit List 2017 – Check Navy MR NMR Result 2017 Medical Exam date & Call Letters Appointment Joining Station for Training on nausena-bharti.nic.in. The successful candidates will be called for medical examination in which all body parts of candidates will be visually & physically verified by the doctors assigned by the authority. The final merit list will be published with appointment/ joining/ allotment of training station where these finally selected candidates will have to report with application form (duly filled and signed by the candidates). Please note that it is compulsory for candidates to carry these forms to INS Chilka after getting them duly filled up & verified/signed by appropriate authorities as indicated. Please be informed that the candidates who do not bring these forms (in their completed state) at INS Chilka will not be enrolled for training at INS Chilka. Bhartiya Nausena had conducted written test for vacant posts of Officers and Sailor Entry Senior Secondary Recruits (SSR) 04/2018 Batch under Indian Navy recruitment 2017-18. A huge numbers of candidates had qualified in this written test and shortlisted for medical examination which is going to be scheduled very shortly by the authority. Earlier Indian Navy had invited online & offline applications for eligible candidates (12th passed with PCB, PCM) started from 26th June 2017 and ended on 09th July 2017. The final selection process was decided to be accomplished in three stages; Physical Fitness Test (PFT), Written test and medical examination. 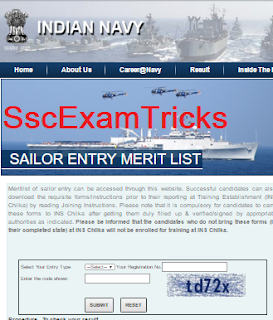 Click on the direct link provided in the end of the page as ‘Navy MR 04/2018 Batch Result 2017 Merit list’. On the official page, first select your entry type; it may be either MR or MNR (option given in drop down list). Second, enter your registration number same as provided during online registration. In the end, enter the code shown in the string on the page. Click on the submit button. Finally, your Indian Navy SSR MR MNR Result 2017 will be displayed on the screen. Note down your performance and certain important information provided on the result page. MERIT LIST OF MR/ NMR - 01/2016 HAS BEEN UPLOADED. CLICK HERE FOR MORE INFORMATION. ADMIT CARDS OF SENIOR SECONDARY RECRUIT/MATRIC RECRUIT/NON-MATRIC- 02/2016 AND ARTIFICER APPRENTICE 140 BATCH HAS BEEN UPLOADED. CLICK HERE FOR MORE INFORMATION.